Are you excited at the return of the Great British Bake-Off on our television screens? 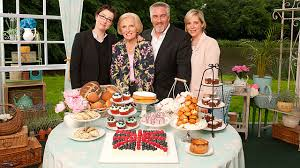 I love the programme with all the different ideas for tasty treats, the banter and getting to know the individual bakers as the weeks go by. I don’t think I could enter the show though as I would hate having to work with other contestants around. I would find that a real pressure. Inspired by the return of the show, I have set myself a challenge of baking some of the things featured on the show week by week. My mum was a marvellous baker famous for her scones, her walnut cake, her butterfly buns and her mince pies. She cooked as a job, at home and at community events. I enjoy baking – I find it calming, creative and love seeing people relish what I turn out on my best days. I don’t claim to be a great baker but this challenge might help me improve along the way. So every Wednesday, I will write a post showing what I have made the week before and how I got on, mistakes and all. I have already made a Swiss roll and intend to do a cherry cake and mini cakes of some description inspired by the TV show. I am making this a linky in case anyone wants to join in and so that we can all learn from each other and have fun. Fancy joining in the Great British Bake-Off Bloggers’ Challenge? As with all my things, there are few rules. Simply post a blog showing your baking efforts inspired by Bake-Off preferably with pictures and/or video. Make an effort to visit some or all of the other posts linked up. That’s all part of the fun of it. I only found out it was back on the other day! I haven’t watched yet so know nothing about what was made but I’ll look forward to reading your posts & maybe joining in!